“Little sister, spines are from flowers, and the flowers often carry a curse. It would be better to gather some flowers in winter than in summer. “It would be better to seed the field when it is humid than when it is made of dust. [Source: pp. 186 – 187, Le Ciel en Colloque avec Marie-Julie Jahenny, by Fr. Pierre Roberdel]. Marie-Julie's soul is restless. She has been struggling to pray, even finding it impossible to pray the Propers on Sunday. 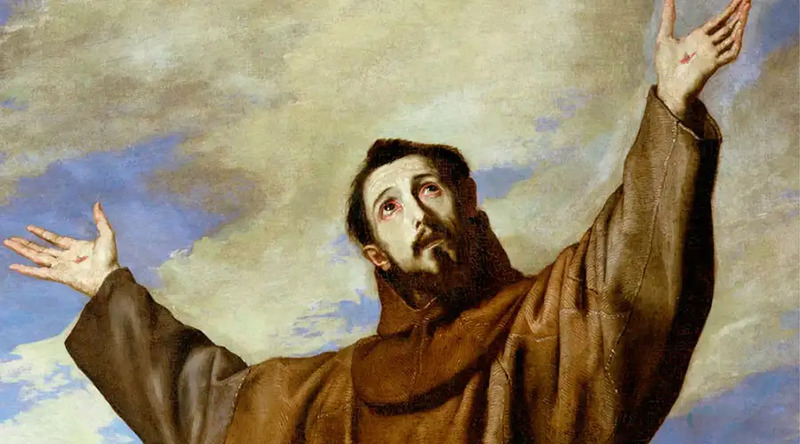 Saint Francis of Assisi, the Seraphic Father, comes to give the counsels, drawing his examples from the simple natural world of streams and fields, the world that Marie-Julie knows very well. His next counsel is for us to cooperate with Grace, and not try to reach beyond the Graces that our souls are receiving for the moment. In this way the Seraphic Father connects the idea of prayer and a strong heart; that is, that the regular practice of prayer helps to build an iron will. And here most of us will understand Marie-Julie's panic, because we have felt this way, feeling that restlessness in the soul which makes even thoughts fragmented and concentration for prayer impossible. He tells Marie-Julie that this is THE BEST PRAYER. Why? Because God made us, He made our souls, and He knows best how to take care of our souls. Who best to keep our souls safe while in this condition than He who created us? he watcheth in vain that keepeth it. Marie-Julie guiltily admits that she has even been unable to do her Sunday duty; that is, pray the Propers for the Sunday Masses. But one has to have the mettle of the Saints to not run away in fear, screaming, “Aahhhh!” at the prospect of not asking God to help us to be happy, for we are so miserable when we are not happy! However, Marie-Julie has been a victim soul for nine years now. Recall that she has embraced a life of suffering for three main intentions: the Holy Father, the French Monarch, and in reparation for the loss of hope in God by persons living in the days of the persecution of the Papacy and the Church (these times). Think of it: Marie-Julie is afraid of being damned due to her inability to pray. She knows that God has made her to love and serve Him, but she fears that she can do neither if she is unable to at least pray simple prayers. And now, in his parting words, he first reassures Marie-Julie that Christ is good. He calls Christ “[t]he good Jesus”. And like when we are comforted by our own earthly father, who holds our hand when we are gravely ill, quietly praying his Rosary with his other hand, Marie-Julie is truly comforted. Her struggles and her pains are understood by her loving spiritual father. Marie-Julie Jahenny lived her life by the Rule of Saint Francis of Assisi, as a Third Order Franciscan, and thus, she was a spiritual daughter of the Seraphic Father. When she died on March 4, 1941, she was buried in the Franciscan habit, as has always been the custom and privilege of Third Order Franciscans. After the worldwide punishment of the 3 Days of Darkness, Catholics will convert to the Truth (being of right mind without the satanic controls) and the holy spiritual Orders will re-establish their disciplines. Deo gratias!